We’ve spent over a year living and traveling in Thailand so you could say we know a thing or two about the country. We often get asked where are the best places in Thailand and what are the best things to do in Thailand? Well, a lot hence why we spent over a year in the country. We always recommend two weeks in Thailand as you’ll be able to see the islands, Bangkok, and Northern Thailand. Thailand is a dream destination for many and when it comes time to plan your itinerary you’ll realize there are so many things to do in Thailand and amazing destinations. No matter where you end spending your time in Thailand you’ll have an amazing time. We’ve put together this list of some of must do & see things in Thailand. There are over 300 islands in Thailand plan on visiting a few. Start by picking the #1 Thai island on your bucket list then plan on island hopping from there. If you need some help deciding where to go, here are the best islands in Thailand. If you ask one of the most amazing things to do in Thailand is out exploring their gorgeous islands. We love just renting a longtail boat for the day and finding our own private island. 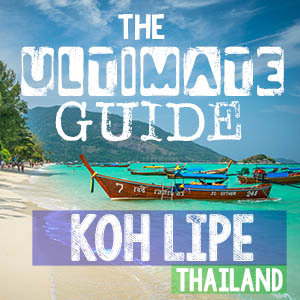 Our favorite island is Koh Lipe! Get a souvenir that will last a lifetime. A Sak Yant tattoo is a traditional Thai tattoo done by a monk with a metal rod (not a tattoo gun). The tattoos are said to be blessed with magical powers, the monk typically decides what you need protection for and your tattoo is based on this. This is definitely one of the most unique things to do in Thailand. However, you can tell the monk what you would like protection for if you prefer. You can get a clean and safe Sak Yant tattoo in Bangkok, Chiang Mai, Chiang Rai, Ayutthaya, and Sukhothai with this company. This is the company we used when getting our Sak Yant tattoos in Chiang Mai. Riding a tuk-tuk in Thailand is a must and a blast. They are more common then taxi’s and typically cheaper depending on your negotiating skills. Always set a price before hopping in. If it’s your first time in Bangkok we highly recommend this Bangkok by night tuk-tuk tour. It hit a ton of Bangkok’s attractions and even skipped the line at the #1 Pad Thai place in town. Watch an infamous Muay Thai fight, which is Thailand’s national sport. Muay Thai or Thai boxing is a full-contact sport known as “the art of eight limbs” because fighters use their fists, elbows, knees, and shins. Almost all major cities in Thailand will have a ring however the best fights are in Bangkok. The best place to watch a Muay Thai fight in Bangkok is Lumpinee Stadium. You can even take Muay Thai lessons for really cheap. 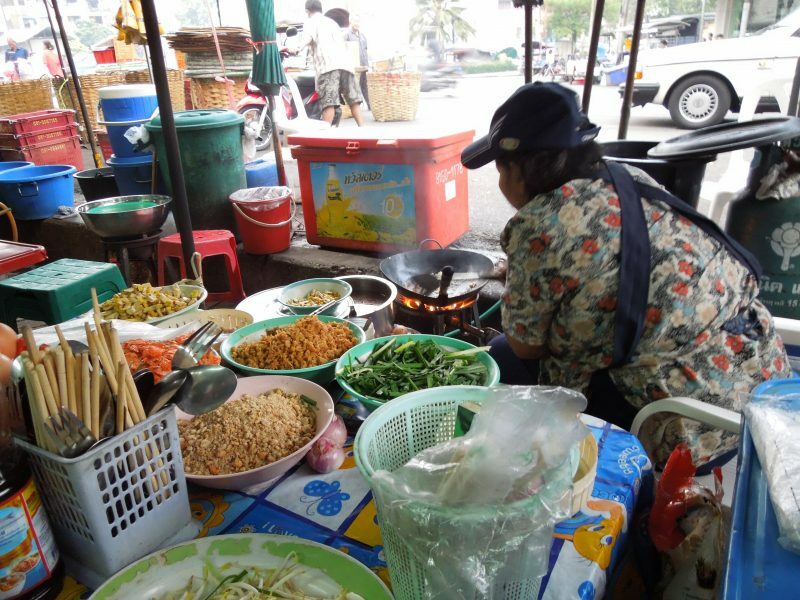 The best way to try Thai cuisine is to take a street food tour. You’ll get to sample everything at affordable prices and have a local guide to explain what everything is and what’s in it. We think the street food in Bangkok is the best place to do this. If your spending one to two weeks in Thailand try and do a street food tour the first few days of your trip, so you can you learn some of your favorites early on. Make sure to read our street food safety article before hitting the streets. Jump in a boat and you’ll feel like you’re on the canals in Venice, well same same but different. We advise skipping lunch before coming, the market is full of fresh fruit and cooked foods as well as local souvenirs. There are several floating markets in Bangkok but the most famous one Damnoen Saduak floating market is located 60 miles outside of the city. There are private tours that do a full Bangkok highlights tour ad Damnoen Saduak floating market for around $100, click here for details. The best floating market in Bangkok is Khlong Lat Mayom. Located in Northern Thailand in Chiang Rai is the picture perfect White Temple. Wat Rong Khun has famously been nicknamed the White Temple for obvious reasons. The temple was purchased by a local artist who spent 40 million baht (over $1 million USD) restoring the temple. Hands down the number one thing to see in Bangkok is the Grand Palace. The detail and architecture are stunning, give yourself at leave 2 hours to walk the grounds. Remember both men & women need to cover their knees and shoulders. If you’ve ever had Thai food back at home odds are it was Pad Thai but eating authentic fresh Pad Thai will blow you away. Some of the best Pad Thai we’ve ever had was on the streets of Bangkok. Make sure to find a vendor that is making it made. For less than $2 you’ll have a 5-star meal. Thai massages aren’t your relaxing massages with oils. If you’ve never had a Thai massage you may be in for a shock, but in a good way if you ask us. The massage starts with putting on an odd pair of pajamas, there is a lot of hitting & smacking the masseuse may walk on your back and they for sure will crack it but when it’s all over you’ll feel ten times better. Thai massages are often the cheapest massages you can in Thailand about $6-10 an hour on average. Sunsets on the beach are awesome but watching the sunset from Bangkok Sky Bar is even better. There are tons of Sky Bars in Bangkok but our favorite is Red Sky Bangkok. They don’t have a strict dress code and they have happy hour 5-7pm with two for one drinks. NOTE: If you go to Lebu State Tower Sky Bar (the one for Hangover 2) be prepared to pay, our friends just went $300 for 4 people, no jeans or flip flops, and the average drink is $20 USD. Learn how to cook all your favorite Thai dishes. Most Thai cooking classes start off at the market so you can easily learn what goes into the dishes and hopefully, you can then spot it at your local grocery store. In our Chiang Mai cooking class, we got to pick which dishes we wanted to cook, and we now have a new appreciation for curry. Curry paste takes a lot of time and elbow grease to make. Walking around Thailand you’ll notice the very large ladyboy population. One of the best places to see the best of the best is at the Chiang Mai ladyboy show which is nightly in the cities night market. This isn’t a ping-pong bar but rather a show but on by entertainers. We’ve been to the Chiang Mai Ladyboyshow three times now and go every time we are in Chiang Mai. For 200 baht you get a drink and about 90-minute show with some amazing ladyboy, they put many women to shame with their bodies & looks. Now, this isn’t for everyone but where else in the world can you eat a crispy fried scorpion? If the scorpion is a little much for you consider the crickets or the ant salad. 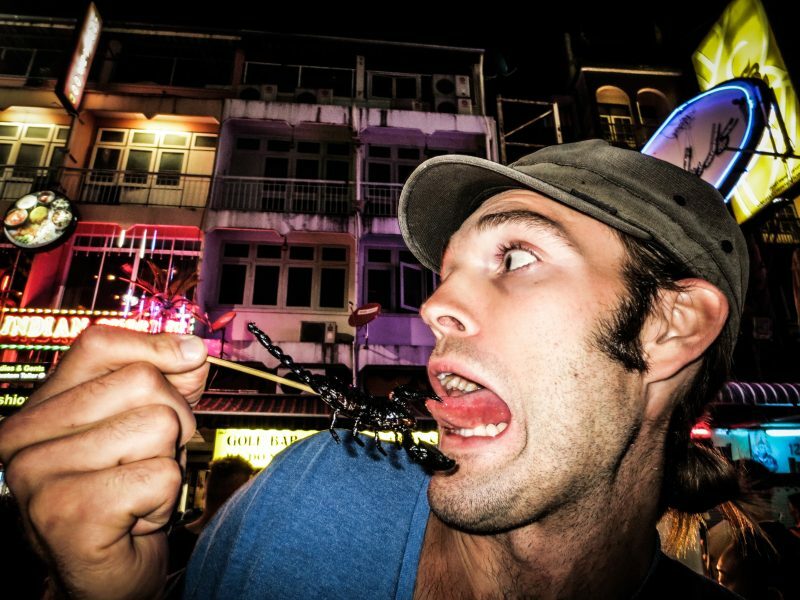 Eating bugs in Thailand is totally normal on Khao San Road. Adam has eaten the entire bug cart twice, here is our Facebook live video to prove it. Watching the movie “The Beach” with Leonardo DiCaprio “The Beach” which is actually Maya Bay has been our bucket list forever. When planning our Thailand honeymoon itinerary this was the #1 thing on it. If you do, we highly suggest renting a private longtail boat from Koh Phi Phi and going really early in the morning or later in the afternoon. The place gets packed with large tours coming and going all day. Rather you’re a party or a people watcher Khao San Road is always a blast. The popular book “The Beach” said Khaosan Road was “the center of the backpacking universe.” Which is an accurate description, this is the epicenter for all backpackers in Southeast Asia. It’s a great place to meet other travelers, get a cheap massage, eat street food, get a little tipsy, and buy cheap T-shirts/elephant pants. Every time we’re in Bangkok we spend a night out on Khaosan Road grab a few Chang beers and get a $7 an hour foot massage on the street and watch all the madness walk by. Explore the underwater world, some of the best diving in the world is in the Thai islands. Almost every island will have a dive shop. Our favorite place to dive is Stonehenge off of Koh Lipe. The most popular place for diving in Thailand is Koh Tao. Whatever you do don’t ride elephants in Thailand or visit any elephant “sanctuaries” without doing your research. Watch this video on Elephant Tourism and you won’t want to visit these places. The only legit place we have found is Elephant Nature Park located outside of Chiang Mai, which rescues and rehabilitates elephants. You can even spend the night in the park. Here are some happy videos from Elephant Nature Park to give you a look at what you could expect. Durian fruit has been nicknamed the stinkiest fruit in the world and for good reason. You’ll often see signs inside buildings, hotels, and taxis that have a spiky root with an X which means NO DURIAN FRUIT ALLOWED. If you open up a durian fruit in a closed space it will stink the entire place out. You can try it fresh, dried, or even durian ice cream but to us, it always tastes bad like old onions inside dirty socks. Make sure to have something to wash it down with. To get a shot like this make sure to pack a GoPro dome to get over under photos. 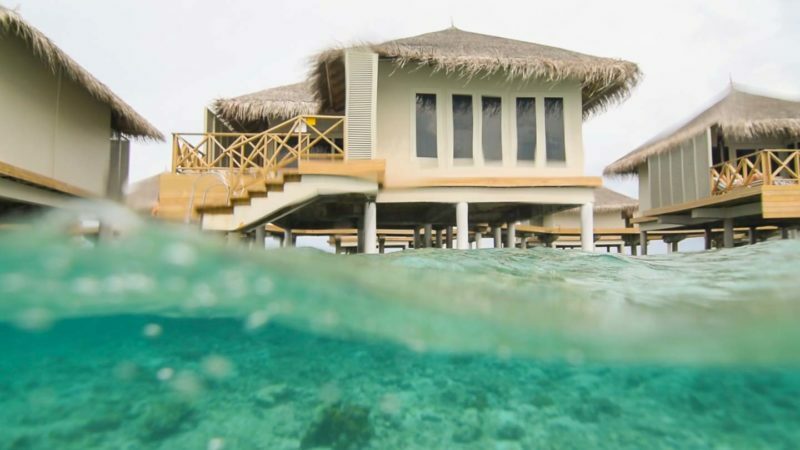 You don’t have to travel to Tahiti or the Maldives to stay in an overwater bungalow. There are several places in Thailand with overwater bungalows, the floating houses on the River Kwai are at the top of our bucket list. This overly sweet concoction is addicting. Usually, for 20 baht you can get a Thai iced coffee. I don’t even want to know how many calories are in this thing, all I know is it fuels my day. There are over 300 temples in Chiang Mai. If you’re staying in the Old City you can’t walk too far without passing another temple. The most famous temple in Chiang Mai is Doi Sutep up on the top of Doi Suthep Mountain. We’ve lived in Chiang Mai on of for 2 years and have only scratched the surface of seeing all the temples. Skip Starbucks and seek out one of Thailands many unique themed cafes. There are cat cafes in almost all major cities but Bangkok’s cafe scene is out of this world. Some of the most popular ones are the Unicorn Cafe where you can rent unicorn onesie’s and the setting is pastel fairyland or head to True Love @Neverland to hang out with some of the cutest huskies. Sukhothai was the capital of Thailand in the 13th century. Visit the resorted temples and monuments which are not a Unesco World Heritage Site. Night markets can be found in almost all cities in Thailand. It’s a great place to grab dinner, shopping, listen to music, and much more. The night markets in Chiang Mai are some of the best there is one every night just outside of the old city, Saturday Night Market, and a Sunday Night Market. We suggest getting to the Saturday & Sunday night markets at 6 pm. If you go later in the night it gets super busy and the streets are packed. Make sure to bring cash. Every vacation needs a day or two of nothing and the perfect place to that is Koh Lipe, our favorite place in Thailand. Think white sandy beaches, turquoise waters, $10 beach massages, cheap drinks, epic sunsets, and the best curry in the world with a view. All of this is found on Sunrise Beach in Koh Lipe. If you want photos like this of the islands make sure to bring a travel drone, there are several travel drones on the market that are easy to travel with. You don’t order a drink in Thailand you order a THAI BUCKET. Pick your favorite alcohol Samsong whiskey maybe and coke and pour it into the bucket with ice. That’s the typical way drinks are served especially on the islands. If you’re into parties make sure to see when the full moon party on Koh Phangan is. If you happen to miss the full moon there are half moon parties in Koh Phangan party. There is always a party in Koh Phangan. For the best views of the island hike up to the Koh Phi Phi Viewpoint. Go early in the morning to beat the afternoon heat and don’t forget water, it’s a workout but worth it. For those looking for outdoor adventures head to Khao Sok Lake National Park for great hiking, canoeing, and rafting. The National Park is over 160 million years and the rainforest is said to be older and more diverse than the Amazon rainforest. You can even stay in overwater bungalows on Khao Sok Lake. The biggest draw to Kanchanaburi is the Bridge Over the River Kwai. Explore Erwan National Park and make time to hike to the Erwan Falls. The Maeklong Train Market is like no other market in Thailand. A train literally comes through the market. You will know when it’s come as the vendors will start taking their good off the tracks and taking down their awnings and the train will sometimes go right over some of their good. It’s just as crazy to watch how fast the market sets back up and is back in business. Make sure to confirm what time the train passes through. Be prepared to wait a little as the train doesn’t always run on time. For those looking for adventurous things to do in Krabi go rock climbing up the giant limestone pillars at Railay Beach in Krabi. Rock climbers from the world flock to Railay Beach. If you never rock climbed before there are beginner tours to teach you the ropes, book online for only $37. Almost anywhere in Southern Phuket, you should be able to spot the Bid Buddha that stands 147 feet tall. tall made out of white marble. The views from the Big Buddha are worth the drive alone. Celebrate the Thai New Year and partake in the world’s largest squirt gun fit, this is one of the coolest things to do in Thailand literally. This happens every April 13-15th with the best place to celebrate Songkran being Chiang Mai. No one is safe walking on the streets. You will get a bucket of water dumped over your head by a sweet Thai grandma. It’s a crazy fun festival, we’ve been twice. If you happen to be suffering from a Changover (below) OR you need quick snack head to a 7 eleven, you are never more than a block or two away from one in Thailand. In the refrigerated section, they have sandwichs they heat up in their little magical toaster. The ham & cheese croissants are the best ones, just say to the cashier “Make Hot.” Don’t laugh, we are serious. We remember people telling us about the toasties when first visited Thailand and we thought they were joking…but after living there for a year we can confirm they are legit. You probably won’t plan on doing this in Thailand but you most likely you will do in Thailand. Well, technically this should be on the NOT things to do in Thailand list. If you drink too many Chang beers you will have a ‘Changover’. 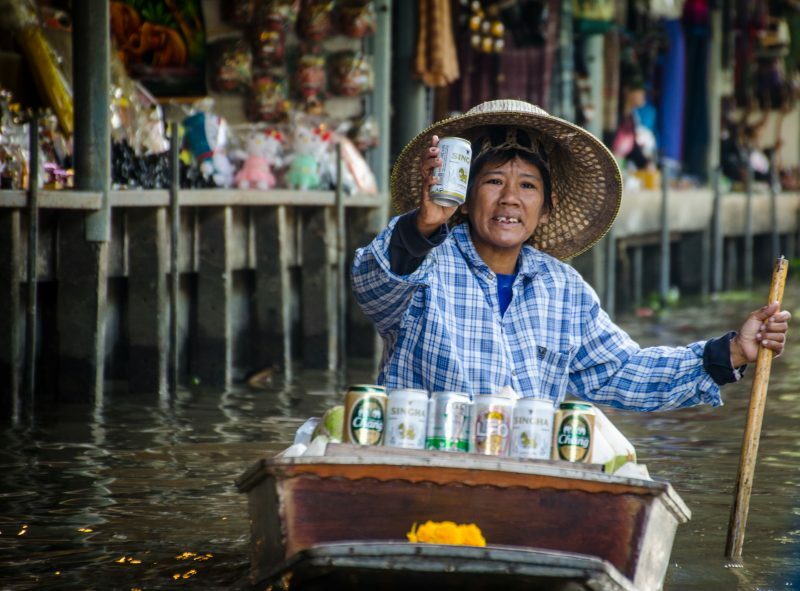 It’s a safer bet to drink Leo or Sinha beers in Thailand. 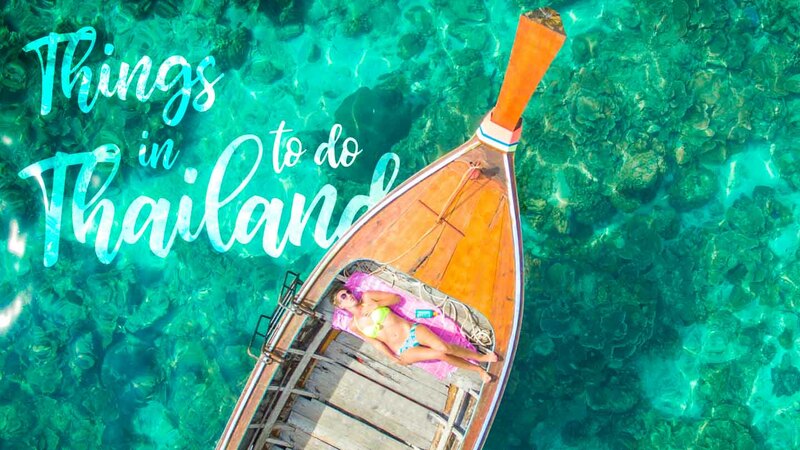 Have you been to Thailand and think we forgot something on this list of things to do in Thailand article? If so, just leave a comment below we’d love to hear from you! Going to Thailand on our honeymoon, staying in Phuket, Bangkok and finishing off in Chiang Mai for 3 nights. We have everything planned for Phuket and Bangkok, but are looking for a bit of help on ‘must-sees’ in Chiang Mai considering the short amount of time we are there. Any help/advice is much appreciated!! Eat lots of northern Tahi food and soak in the culture! Enjoy Chiang Mai and the rest of your Thailand Trip! Hi looking at travelling with a fussy eater. Is there lots of plain food options? If you are traveling to bigger cities like Bangkok, Chiang Mai, Phuket, some of the islands they will have all your American Chains like McDonald’s, KFC, Burger King, etc. You will be able to find a place with burger, fries, pizza all over Thailand. Hopefully, they are willing to try some things because the food in Thailand is amazing. Hi looking to travel to Thailand for first time with our 7 year old. Planning for Bangkok and Phuket. Please recommend places to stay in Bangkoksi we can also do sight seeing At ease. We have a guide on that too –> https://www.gettingstamped.com/where-to-stay-in-bangkok/ We always love the Sukhumvit Area, but that might be a bit too busy with a 7-year-old. I would probably suggest staying along the river. Have a great trip to Thailand!